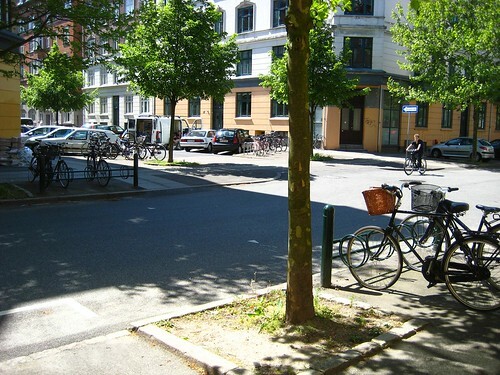 One of our readers from Vancouver sent a mail asking about how we Copenhageners park our bikes outside our homes. Most buildings have bike sheds in the back yard where residents can park their bikes. Here at our place we have four bike sheds for about 40 flats. We have easy access from the backyard to the street. There are, however, many flats where getting from the backyard to the street takes time. Even just a couple of minutes is a frustration. 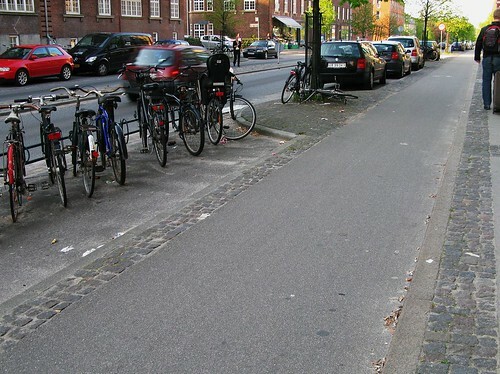 Copenhageners want the quickest possible route from their front door to their bike and then the bike lane. It's all about ease-of-use. It's irritating if you have to spend too much time getting onto your bike. I'm sure there are people in Copenhagen who keep their fancy specialist bike in their flat, but I don't know any. Your bike is in the shed, the bike room in your cellar or leaning up against something outside your door. 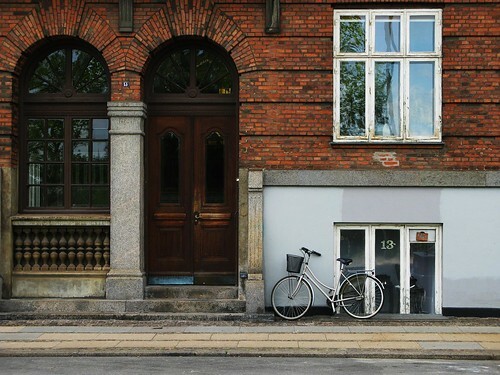 Most people opt for parking their bike along the building, using their kickstands or leaning them against the facade. Chaotic at times but it is the fastest way to get going. Out of the front door, unlock the wheel lock and you're off. There are also a growing number of bike racks on the streets. This intersection is 50 m from my flat. You can see four bike racks in the shot and there are two more out of frame to the right. They're well used and help keep bikes off the facades. There's a tendency of late to utilize parking spots on the street and place bike racks in their stead. This design idea is a direct response to the habits of the citizens who want, and demand, ease-of-use. Given the fact that bikes in the heart of the city and the surrounding neighbourhoods far outnumber cars, it makes sense. On average, in the neighbourhoods surrounding the city centre, only 30% or so own cars. That statistic is a gold medal on the chest of the city for creating bike lanes and infrastructure over the past 40 years. You simply don't need a car to get around. More bike racks in former car parking spots. I have a set on Flickr with bike racks ad libitum. 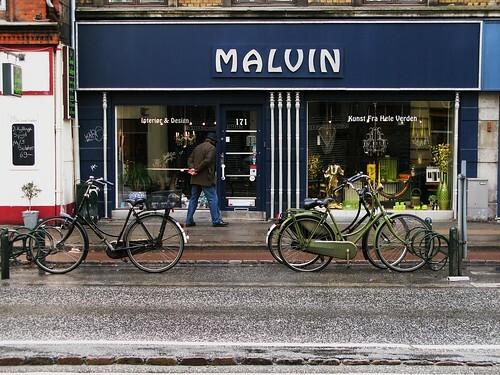 And there are a couple of earlier posts on bike racks in Copenhagen. This one and this one. tags: "bike culture", "bike infrastructure", "bike racks"